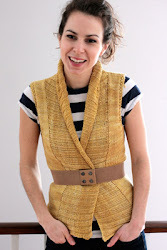 This week I got an e-mail from the super talented Adrian over at Hello Yarn. She let me know that I could buy her perfect Fiddlehead Mitten pattern from her wholesale and package it with kits made up of my yarn. That news really made my day! 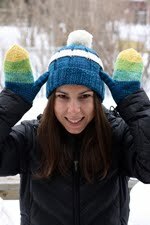 I've been a big fan of this pattern for a while now and have personally knit two pairs, my favorite pair was knit with my very own Yellow Label yarn. I finally got around to knitting the lining for this pair, it was super quick and makes the finished mitten extra warm and soft. I've spent part of the afternoon winding these mini skeins that will go into the kits. I'll have them for sale at my booth at the Kitchener-Waterloo Knitters Fair, and then on my Etsy site. Above is the colourway that I knit my pair in, but I'd like to offer the kit in more than one colourway. Maybe something blue and green? Last year I knit Ysolda Teague's adorable Elijah stuffed elephant for my cousin's baby Elliot. It was so adorable and I immediately fell in love with it. I borrowed it to use in my booth at the Toronto Knitters Frolic last April, but figured that it would be cruel to steal a baby's stuffed animal on a regular basis and that I'd be better off just making my own to bring to the Kitchener-Waterloo Knitters Fair this September. This time I made mine in Sweet Heart pink. The pattern was just as clever and fun to knit the second time around. I'll confess, this afternoon I laid down for a bit of a nap and couldn't resist sticking with my new stuffed elephant under my arm. He fit perfectly, and his little limbs were very comforting snuggling in the palm of my hand. I doubt this will be the last time I knit this pattern. I love her for so many reasons, her sense of humour, her great sense of style (she showed up at my place today with the latest issue of Knitscene and questions about how to get started on the same sweater I want to make in that issue.) I love her pretty hair, the way we can spend countless afternoons together doing nothing but somehow always filling the time with talking and laughing. Now I love her even more, because she knits, and she knits really well! 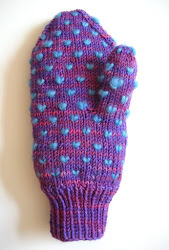 A while ago she gave me a call and told me that she really liked the socks that I had knit her for her birthday, and she thought that she might like to try and make some herself. I sent her a care package of sock yarn, and now, less than a year later, she's knit at least 8 pairs of socks, including some pretty fancy ones! She's modeling her Spring Forward socks in a one off colourway that I dyed a while ago. It was really nice to get to spend the day with my cousin. Today I sent her off with more sock yarn and some lace weight yarn, I can't wait to see what she makes next. Katie + my yarn = beautiful! Remember when I mentioned that my friend Katie was knitting a blanket with my yarn? Well, it's coming along very nicely and she's got this super cool bird cage that she keeps the yarn in. 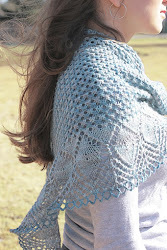 She's also got a couple of photographer friends who used her and my yarn for a photo shoot recently. Check out the amazing results here and here. Thanks so much Katie for sending me these links! My Kureyon sock yarn cardigan is coming along very nicely. I've already finished knitting and blocking both fronts. Some people try really hard to make the colours match up when knitting with self-striping yarns like this, I on the other hand, try really hard to not have the colours match up. I think that the way that the colours appear naturally and fluidly is so pretty, and by just letting the yarn do it's thing you end up with a much more organic result. I do sometimes make an effort to end up with a somewhat even distribution of colour (like I did in my Kureyon Hoodie) but other than that, I just knit and watch the colours change on their own. I thought that knitting a sweater out of sock yarn would end up being a never ending project, but it's really whipping along. This is a fitted cardigan, so it's really not that big, which means not that much knitting. The widest part of one of the front pieces is 54 stitches, that's less than the circumference of one sock! Hand dyed, hand spun, hand knit hat! Simple pattern, simple hat, huge rewards! This is my first finished project using my own hand dyed superwash merino roving (available in the shop soon) that I spun into 2 ply yarn all by myself and then knit into this very cozy, super soft, really warm hat. I couldn't be more proud! 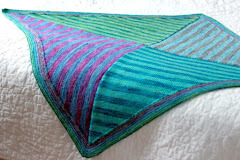 I had no idea how/if the colours would stripe as I knit with the yarn. I'm very pleased with the result, it has subtle variation and interest, what I always aim to achieve with my hand dyed yarns. I had 130 yds of yarn and have quite a bit left over. I've got 3 more skeins of my hand spun wound into cakes all ready to be knit with! Remember when I said I wouldn't spin any more yarn until I had knit with some of my current stash? Well, I honoured that vow and now I'm ready to get spinning again! After a week at the cottage, which incidentally also means of week of escaping from reality, from responsibilities, from thinking... I now feel fully rejuvenated and ready to take the plunge and tackle a big project that I've been wanting to start for a couple months now. Back in April my mom gave me Noro Collection Book 3, and I immediately cast on for Design 6. I am so happy with the results that I'm confident that this next project from the book will turn out just as well. It's Design 26, knit in Kureyon sock yarn in colourway #220. I know I'm not showing much creativity by again choosing to knit the pattern in the colourway suggested in the book, but I just love the look of this cardigan done in these colours! I'll admit, this project is a little bit daunting, for one thing, I can't find anyone else in the world who has knit this pattern, not on Ravelry, not in any google search, which makes me wonder if I'm the only one who likes it!? It's also my first adult sweater project knit on 3mm needles out of sock yarn, but I'm a small adult and the yarn is so fun to knit with that I'm hoping it won't be that tedious. Lastly, I'm a little concerned that maybe it's not going to be the most practical of wardrobe pieces... Regardless of my uncertainties, I'm going to plow on. Wish me luck! I'm very glad that our day bed was able to make the move to our new apartment. This bed was my bed for 20 years. It was my first and only bed until I moved out and finally graduated to a bed bigger than a single. When we moved into the loft my mom said I could take it if I had room, I gladly accepted. Call me sentimental, but I love it. It now lives in the room we call the studio and continues to hide my stash of non-TFA yarn underneath it. One of my favorite things about our new place is the closet space! The studio has the smallest of the three closets, but it's perfect for storing all my sewing supplies, shipping supplies and spinning accessories. The top shelf holds all those things that we move around with us but rarely use, Christmas decorations, a box of old cd's, painting junk... and there's still plenty more space to use in there. Excuse the mess on the desk, we're tackling one thing at a time here! I realize that it's absolutely designed to go in a kids room, but it's so fun and simple (lots of ceiling fan's are pretty extravagant!) this pop of colour suits us just fine. I'm loving it. It's very soft and is knitting up beautifully. It's my first project using my own handspun yarn, and I think I'm hooked. I'm back from a whirlwind vacation at my cottage in Amherst Shore, Nova Scotia. We had an amazing time. My whole immediate family was there, plus significant others, plus dogs, plus a whole lot of extended family! The week went by way too fast and I now understand why so many people insist on taking two weeks instead of just one. One week is definitely not enough! I really needed a break though, I was really run down. I was so exhausted that I didn't even knit a single stitch while I was away. I brought only one sock in progress to work on, but spent all of my time reading, sunning, swimming, hammock-ing, eating, cocktail-ing and playing instead. A week away from real life is always great, now I'm back in Montreal and really ready to tackle my work! This morning Chris and I went to Home Depot and to Ikea and were home before noon, now to set up the apartment and hopefully et the place looking like a home rather then a storage space by the end of the day! Wish us luck!